Capify provides effective funding options, from business loans to a merchant cash advances, which are flexible alternatives to a traditional bank loan. We provide you with a lump sum to use as working capital and we are repaid through future credit and debit card sales, or small daily repayments. The repayments work alongside the ebb and flow of your business so we only get paid when you get paid, and you could raise from £3500 to £500,000. 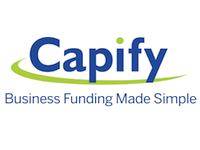 Capify is a one-stop shop for businesses seeking working capital solutions for their business in UK and abroad. For business loans, we serve limited company and you have been operating for 9 months. For cash advances, we serve businesses who take a minimum of £3,500 of card payments a month. A loan from Capify is different in that there are small daily payments automatically debited from your bank account as opposed to having to come up with large monthly payments. Additionally, there is a quick application process, no personal collateral is needed and funding can be done quickly so a business can cover even its most unexpected of expenses. “When my business needed assistance Capify were able to came through and fund us, very straight forward and painless process specially as it was processed over the Easter period’’. “Excellent service. As a business that has been trading for just over a year I can say that they will be there always to help you to achieve your goals’’.